Samsung Galaxy Tab vs. Apple iPad: How Do They Compare? The launch of the first iPad contender is impending. The Samsung Galaxy Tab is scheduled to launch in Germany on September 2, and it is assumed that it will be available in the United States sometime this fall as well. Since the obvious comparison is Galaxy Tab vs. iPad, let's take a look at how the two tablets stack up against each other. The Samsung Galaxy Tab is smaller than the current Apple iPad (although rumors suggest a smaller 7-inch iPad model is in the works). The iPad is almost the size of a standard sheet of paper at roughly ten by eight inches, and it weighs a pound and a half. We don't yet know the weight of the Galaxy Tab, but based on a video teaser the size appears to be similar to the Amazon Kindle. The iPad has a 9.7-inch touchscreen display capable of 1024x768 resolution. As the smaller size mentioned above implies, the Galaxy Tab display is smaller. The Samsung tablet uses a 7-inch display originally thought to be limited to 800x600 resolution, but newer speculation is that it is 1024x600. Apple designed a custom A4 processor for the iPad. It is a high-performance, low-power system-on-a-chip running at 1GHz. 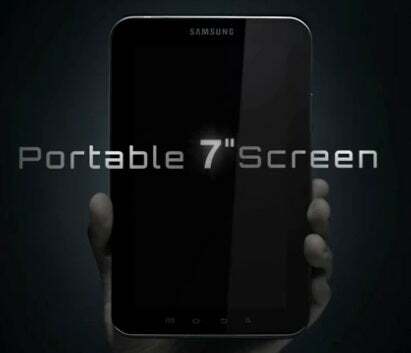 Sources report that the Galaxy Tab will run on a similar 1GHz ARM processor. While the iPad runs a version of Apple's iOS, the Galaxy Tab will run on its primary mobile OS competitor--Android. The iPad is currently stuck on yesterday's iOS with version 3.2.2. It is slated to get an update to iOS 4 very soon, which will add functionality like nested folders and multitasking. The Galaxy Tab will reportedly come out of the gate with the cutting edge Android 2.2, a.k.a. "Froyo". Both the Apple and Android app stores have more than enough variety to meet the needs of virtually any user. Granted, the Apple App Store has crossed the 250,000 apps mark, while the Android Market lags somewhere around 100,000, but at some point it becomes like the Cold War nuclear arms race between the United States and the Soviet Union: how many times do you need to be able to blow up the whole planet? Many of the features are similar, but this is one area where the Galaxy Tab doesn't just compare, but can set the bar for what to expect in the next-generation iPad. Based on the video, it appears that the Galaxy Tab has both front and rear-facing cameras, and is capable of video chat. The Galaxy Tab is also expected to support Adobe Flash, and possibly be able to play HD video. When it comes to making an actual purchase, it rarely boils down to comparing spec sheets. There are intangible factors that come into play. How much does it cost? Which wireless providers support the device? The Galaxy Tab will have the benefit of riding the wave of tablet demand created by the Apple iPad, but it is also at a disadvantage compared with the three million plus unit jumpstart the iPad has. Still, there are people who love Apple and iOS, and there are people who love Android. The Galaxy Tab looks to be a very capable device and will at least offer a worthy challenger in the tablet market.